Cast Aluminium and Cast Bronze heaters offer optimum heat transfer directly to the contact surface. These heaters are usually custom designed in house using state of the art cad ware alongside many years experience to obtain maximum heater life. Every shape and size can be manufactured in our modern patternshop and foundry, before being fully machined in our machine shop prior to termination at final assembly. There are many terminations available from metric to American threads, high temperature leads to high temperature plug and socket arrangements. They can be designed as heater only, water/oil cooled or air cooled. 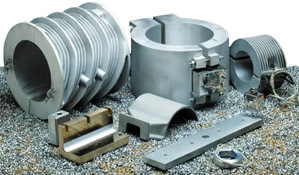 Insulated or un-insulated cowls are available in sheet steel or Cast Aluminium. Our experience has evolved from the very first finned heaters supplied to the extruder industry into complete insulated units which can also be supplied with top quality blowers ready to install straight onto the extruder barrel. The design offers the maximum surface area for optimum cooling efficiency and minimum energy loss. Our design team have the capability to manufacture complete lines for renewal of existing air cooled lines or for the conversion of older water cooled extruders. Our facility allows us to manufacture a wide range of sizes to suit the smallest extruder up to the largest. Cowls can be insulated or un-insulated in Aluminium coated mild steel or Stainless Steel, they can also be supplied in Cast Aluminium or Cast Bronze for areas where a more robust unit is required. ・Surface to be heated must be clean from contamination, smooth and compatible to the machined surface of the heater. ・Water fittings must be free from leaks, threaded connectors are the most common way of ensuring this. ・Heater must be seated correctly and securely clamped to the extruder barrel. ・After initial warm up to operating temperature, the heaters should be isolated from the electricity supply and re-tightened to compensate for thermal expansion. ・All connections should be made with suitable high temperature wiring. Terminal enclosures can be provided up to IP65 for ease of wiring and operator safety. All units must be adequately earthed. ・Heaters must be disconnected from supply before any maintenance is carried out. ・Heater clamping arrangements should be checked regularly and re-tightened when required.